This design, from J&P Coats and Clark, is a vintage crochet pattern dating from about 1952. Finished size is approximately 48 x 64 inches. Gauge: Each motif on this afghan measures 3 1/4 inches square. Starting at center with Yellow, ch 4. 1st Rnd: 15 dc in 4th ch from hook. Join with sl st to top of ch-3. und. Join to tip of first cluster. Break off. 3rd Rnd: Attach Grey to any sp, ch 3, 4 dc in same sp, 5 dc in each remaining sp around. Join. 4th Rnd: Ch 5, dc in same place as sl st, * ch 1, skip next dc, half dc in next dc, (ch 1, skip next dc, sc in next dc) twice: ch 1, skip next dc, half dc in next dc, ch 1, skip next dc, in next dc make dc, ch 3 and dc. Repeat from * around. Join and break off. Sew motifs neatly together on wrong side, having 14 rows of 19 motifs. 1st Rnd: Attach Yellow to any corner, ch 3, 4 dc in same corner, dc closely around, making 5 dc in each corner, join and break off. 2nd Rnd: Attach Grey to same place as sl st, ch 3, dc in each dc around, making 5 dc in center dc of each 5-dc group. Join and break off. Source: J & P Coats Clark’s O.N.T. 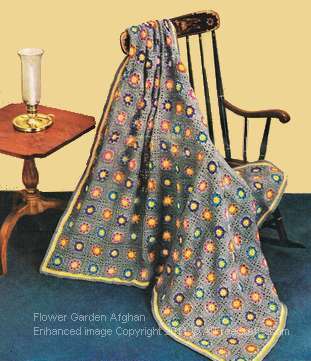 Afghan Book No. 289, Afghans, originally designed for Chadwick’s Red Heart Yarns. First Edition, July 1952.